Whenever new technology pops up, businesses draw a bead on it – and this is what happened with the drones. As McKinsey states, the drone activity value raised from $40 million in 2012 to $1 billion by 2017. The company estimates that, by 2026, commercial drones will annually impact the country’s GDP with $31 to $46 billion. Drones are fast, autonomous and they can fly – sounds like a new land of opportunities for the retailers who have been struggling with the “last mile” problem for a while now. In 2016, Amazon introduced its Amazon Prime Air delivery and Google and Walmart followed along. Seems like all the major players in the retail industry are now investigating the ways to implement smart delivery into their processes – but what about small businesses? Would it be possible for a humble online store to pick on the trending technological marvel? In order to successfully implement all required integrations and modules, it’s best you use a customizable and flexible platform like Magento. This is why we will use it as an example. We spoke with the technical specialist about Magento shipping integration, delivery process and technical moments. To go into detail, let’s imagine the following situation. 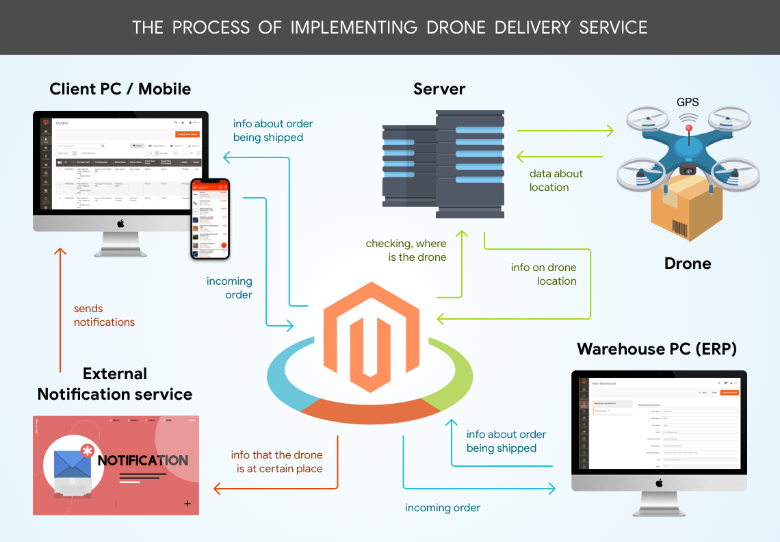 An owner of an online store turns to a Magento development company to implement drone delivery service in his eCommerce business. The store has its own warehouse, and the owner has just purchased a dozen of brand-new drones ready to take off – but how to integrate this and how will drone delivery work? The whole system of order placing is clear – so let’s talk about drone management. While on its way, the drone will communicate with the server and share the data about its location. Magento will need to communicate with this server as well in order to “know” where the package is at the moment. Task #1: Develop a system of interaction between Magento and the server. As well, the client would probably wish to receive notifications about the order status. For that, the drone needs to communicate with the external service or an app that would, in its turn, send notifications to the client via the preferred method. Notifications, including push notifications, can be sent to the PC (either via a guest link registration or existing client account) or to the mobile device (SMS). Task #2: Develop Magento integration with the external notification service. In short, that would be it. However, the business owner would also need to connect the drone to the server and the notification service. The drone manufacturers should be able to handle these questions and provide you with support, as commercial drones are sold with a pre-installed flight computer. As for Magento extensions and plugins development, that would be quite an easy process. One of the biggest issues that big retail companies struggle with is drone payload capacity and its time of flight. If we take Amazon Prime Air as an example, its test packages did not exceed 5 pounds (approx. 2.5 kg) and its commercial delivery drones were able to fly for 15 miles only (7.5 each direction) before the battery went low. This is certainly not enough for a giant and global retailer with all sorts of goods available. Drone performance depends on a number of factors: battery type, drone weight, add-ons (i.e. a camera). The most critical among them would probably be the battery capacity as it directly influences the amount of power that is required for the necessary propeller thrust. You can check out the top-10 long-flight time drones here, ranged from the longest to the shortest flight time. But this issue may actually become a competitive advantage for small businesses. The world already saw the delivery of coffee in Dubai, the delivery of Domino’s pizza in New Zealand and donut delivery in the USA. It’s clear that F&B and businesses with light-weight packages would be among those who’d benefit the most from drone delivery service, combining unique customer experience and compliance with regulations towards drone weight and load. The second issue is regulatory and includes compliance with air traffic and with set of rules and guidelines from the Federal Aviation Administration. One of the ways to solve the problem is integration of the air-traffic management systems within the whole drone operating system. However, if the delivery is short-distance, the operator will be able to monitor the smart drone and interfere if anything goes wrong. Another pain point is the “last 50 feet” delivery. There is no problem with drones navigating themselves and avoiding obstacles, thanks to the implemented sensors and GPS navigation. The problem lies in safe landing and accurate delivery. If you live in an apartment or a block house, the landing of the package may be tricky. Again, small businesses can simply offer a hand-picked delivery, as Costa Coffee did in Dubai. This would add the additional fun element to the overall process. Drone parcel delivery will, first of all, cut down the “last mile” costs while reducing the customer waiting time significantly. According to Deutsche Bank estimations, Amazon will be able to cut down the “last mile” shipping cost by 80% if using drones – and such cost reduction would not be exclusive for big businesses only. Secondly, drone delivery boosts customer experience and therefore, adds to the company’s competitive advantage. The Costa Coffee UAE customers, Denver Mayor Michael Hancock who got his donuts delivered by a drone and other people who already experienced robot delivery – all of them were genuinely surprised and excited about the possible deployment of robots into the delivery process. In a report by Statista from 2017, 51% of the USA respondents said they would either definitely or probably use drone package delivery. 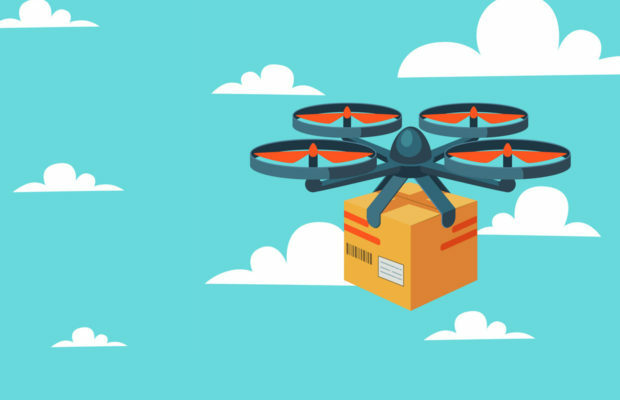 While the giants of eCommerce industry are struggling with the above mentioned issues, small companies can already benefit from using drones as part of their delivery service. Once the governmental regulations are resolved, savvy eCommerce businesses will receive a green light for stepping up their performance and gaining competitive advantage.